Studying, working, or interning abroad can be one of the highlights of your university career. You will have wonderful and challenging experiences that will allow you to grow both academically and personally, not to mention prepare you to compete in today’s globalizing world. We know that planning for this experience can be daunting, so we have assembled some key information below to help get you started. The most important thing to remember is that the UA Education Abroad office is here to help you every step of the way. Explore the hundreds of programs UA offers in locations and countries all over the world! Search all study abroad courses that have been pre-approved for credit at UA. Education Abroad is committed to fostering the values of inclusion & equal opportunity! Quick answers to common questions asked by students and parents! 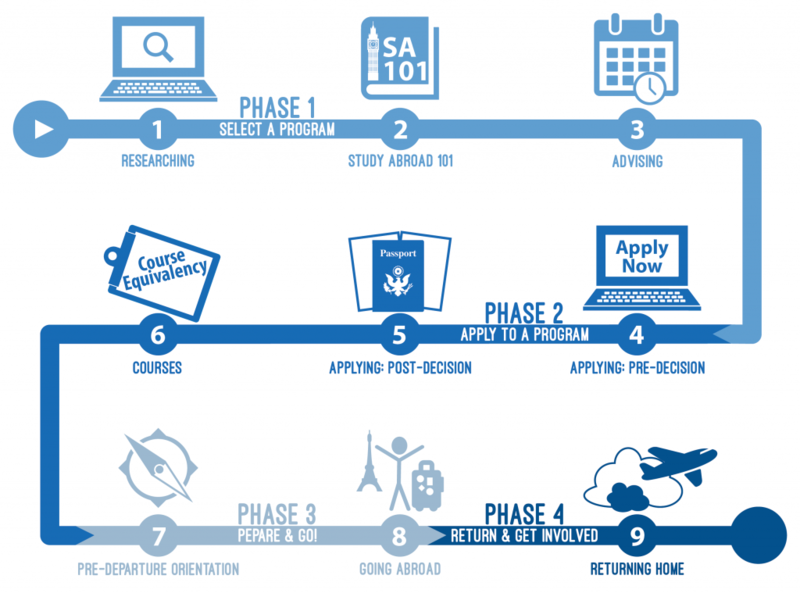 Preparing to study abroad can sometimes seem like an overwhelming or ambiguous process. This process can be different for every student and may be influenced by such factors as academic major, personal interests, class status (i.e. freshman, sophomore etc. ), program type, and location. Though every student’s study abroad experience differs, here is a general overview of the steps students take while applying and preparing to study abroad. If you need help at any point, please utilize the Education Abroad team as a resource to help you along your journey! Research programs on our website using the “Program Search.” Consider location, course offerings, costs, and terms programs are available. Start communicating with your college advisor about which courses you should try to take while abroad. Education Abroad holds Study Abroad 101 sessions every week in our office. Come interact with our staff and interns to learn about the study abroad process and our personal experiences abroad! Schedule an appointment with your study abroad adviser for guidance at any phase during the study abroad process. Online, Call (205-348-5256) or stop by 135 BB Comer to schedule an appointment. To begin an application, click the “Apply Now” button at the bottom of the brochure page of a selected program. ALL Pre-Decision questionnaires and signature documents must be completed before the application can be reviewed and marked as “UA Endorsed”. Once the student has been accepted to a program, they must complete ALL of the remaining Post-Decision documents and materials. Complete the course equivalency process. This allows students to know how their classes abroad will apply to their degree. PHASE 3: PREPARE & GO! Students are required to attend Pre-Departure Orientation (usually during dead week) prior to their trip. Pre-Departure Orientation covers health and safety, security, cultural adjustment, expectations for behavior while abroad, and travel tips. Go abroad! Engage the local culture and work hard in class! Before returning to UA, students are required to complete various “while abroad” materials in their UA application. After returning home, many students wish to go again. Meet with our staff to set up another trip. Also consider applying to be an Education Abroad intern and participate in our photo contest. There are many opportunities for students once their study abroad experience has concluded! To learn more about Education Abroad – how to find a program, how to start an application, things to consider etc. – attend one of our Study Abroad 101 sessions held daily in our office (135 B.B. Comer) at 2:00 p.m or set up an appointment with an advisor today! You can also discuss how your study abroad program could be incorporated into a Global Studies Certificate.